My Pasta alla Genovese is an exquisite masterpiece of a meal that Italian renaissance painter, Caravaggio, could have featured in his shadowy, luscious paintings. Well, this Culinary Artist has made a video which is suitably framed in your computer monitor. 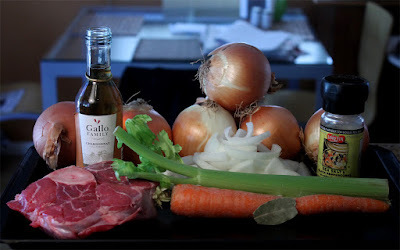 The ingredients are humble, just beef, onion, carrot, celery and a little white wine. And the recipe is easy to do. This rich pasta dish takes a lot of time cooking, kind of like a pot of beans. But, it's worth it. Just put it on after lunch and 3 or 4 hours later, it's ready. It only needs a stir every once in a while. And you may shed a few tears chopping a dozen onions because it takes about 4 pounds worth. I sliced 8 cheap yellow onions for my recipe. It doesn't take too long to do it since the onions are only roughly sliced. They will soften, shrink, and cook down to a thick pasta sauce. Onions are the cheapest veggie. Usually priced way below 99 cents per pound, and yellow onions are often on sale for 3 to 7 pounds per dollar. You can use any type of onion you like. 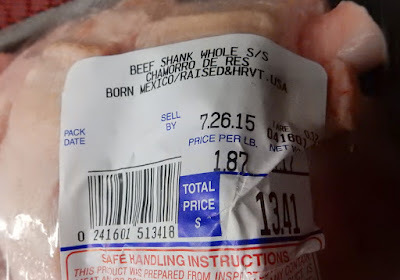 I used the cheapest cut of beef I could find - beef shank on sale at my local Latin market for around two dollars per pound. 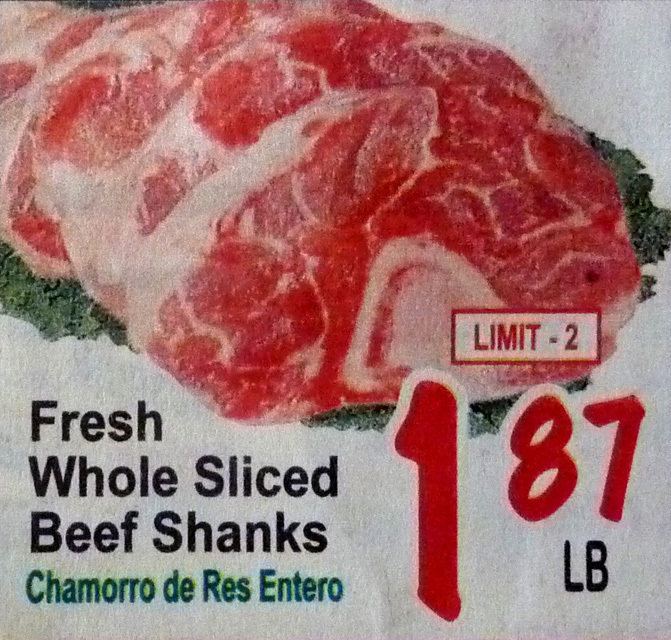 Beef shank is a tough cut of meat, that's why it's a bargain. But if you cook it for a couple of hours it gets fall-apart tender. And if you want to keep it cheaper, then try combining pork and beef. For beef at $1.87 per pound, you have to by the whole shank. 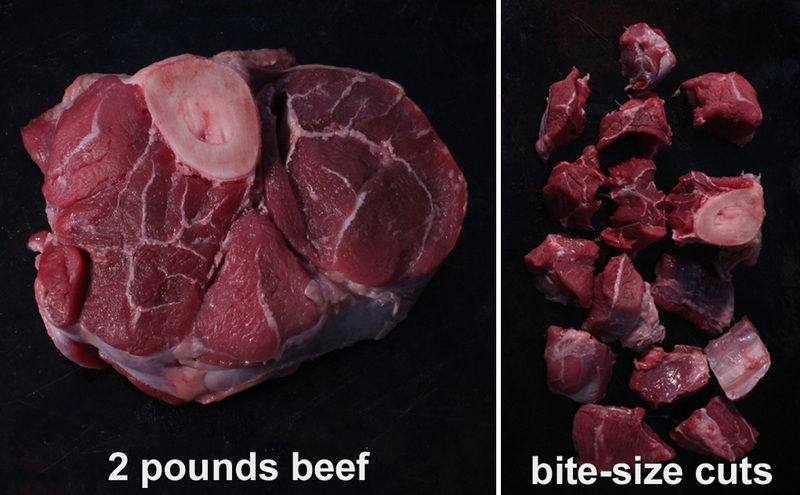 This cut of beef freezes well for stews, or a hearty beef chili. For this cheap$kate recipe it takes 2 slices of these bad boys. I splurged and purchased a package at $2.29 per pound, for $3.16. I got about 5 servings with pasta - that's still an excellent deal. 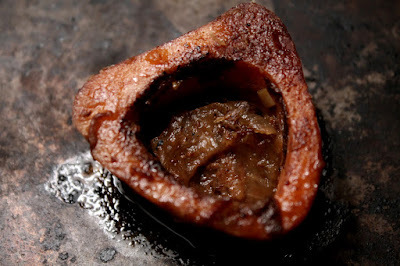 I like beef shank because there is a wide bone in the center that's filled with buttery marrow. Make sure to scoop it out to eat when done - that's the cook's reward. So check out my recipe video below for Pasta alla Genovese. Your guests, or family, will be impressed with this luscious, Italian edible masterpiece. Play it here, video runs 3 minutes, 16 seconds. 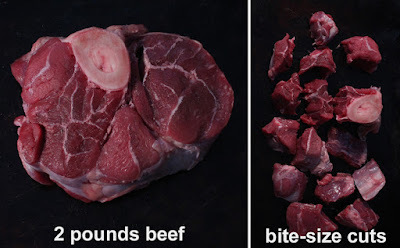 1 to 2 pounds beef - I used a package with 2 beef shanks (about a pound and a half.) 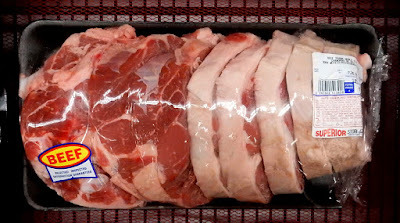 Beef chuck blade steak is cheap too. 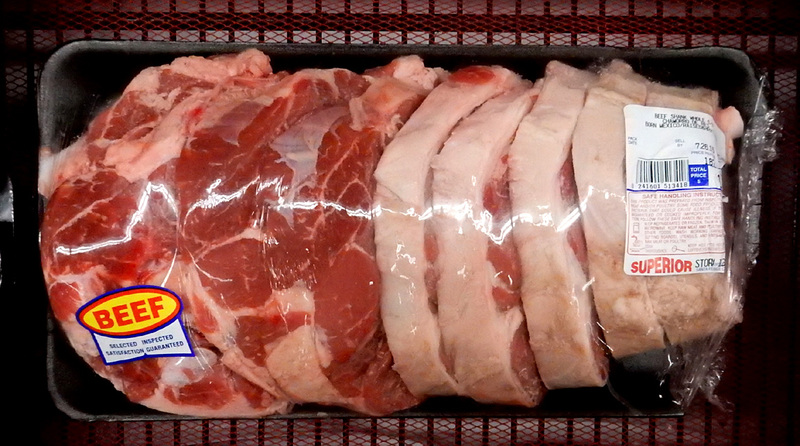 Some recipes call for a mix of pork and beef - that right there make this recipe even cheaper. You could even go for the cheapest way by using chicken leg and thighs. 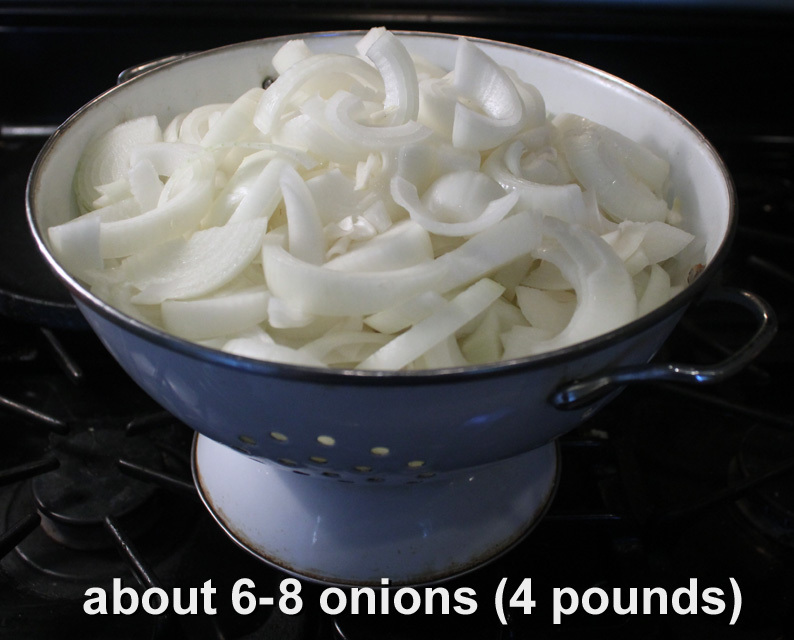 4 pounds of onions - or about 8 whole onions, roughly sliced. Red, white or yellow onion. I used cheap yellow onions. 1 whole carrot - chopped. Okay to use shredded carrot from the package (about a cup.) For baby carrots, just roughly chop the equivelent of a whole carrot. 3/4 cup white wine - optional, okay to use red wine. 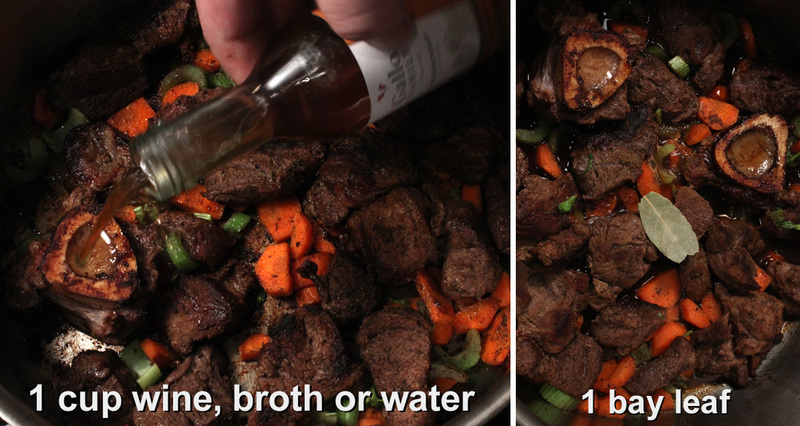 If you leave out wine then add water, or a favorite broth, instead. 1 bay leaf - optional. Tablespoon of oil - for sauteing beef and veggies. 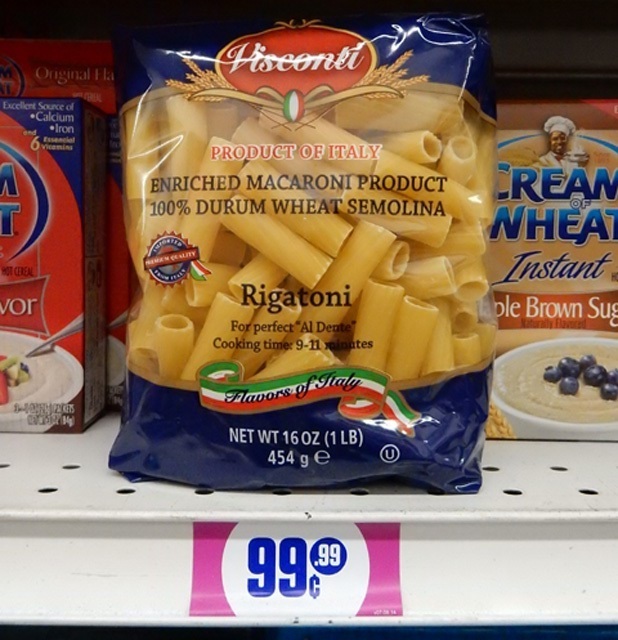 Pasta - usually a penne or large tube pasta is used. Although, you can use any favorite you have on hand. Parmesan - dried or fresh when serving. I used 2 beef shanks (about a pound and a half.) 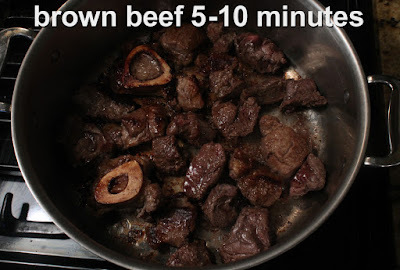 Slice beef into large cubes. It will eventually shrink and break apart. Trim any excess fat, although I like me some fat, so don't discard it all, that's extra flavor. In your largest pot add a tablespoon of oil over a medium heat. 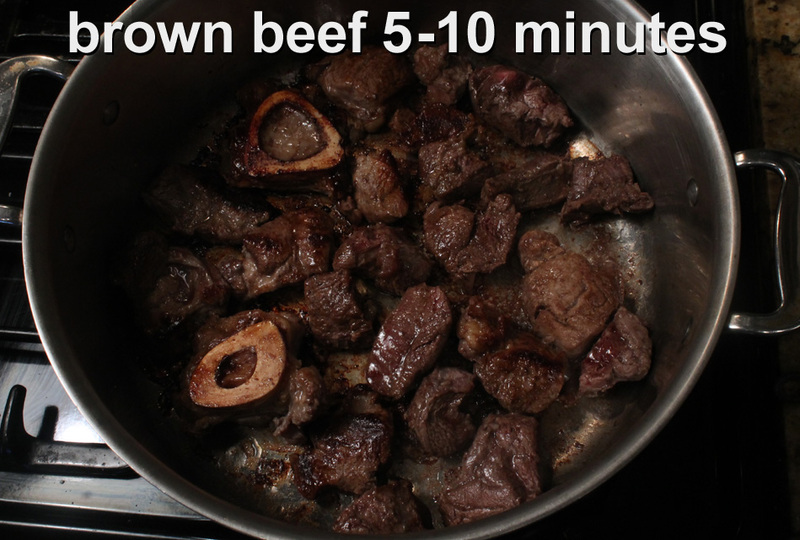 Add the cubed beef and saute for about 5 to 8 minutes to brown, at least, one side. This will give the sauce a rich, dark hue. Stir beef when brown. 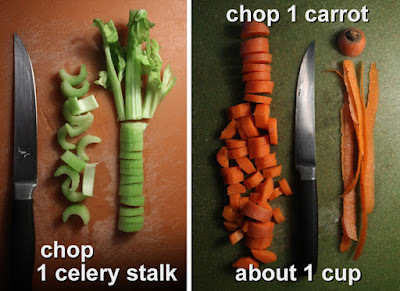 While beef cooks, slice carrot (discarding ends) and celery. You can use celery leaves, too. Next add the chopped carrot and celery to browned beef. Season with salt and pepper. Saute for a couple of minutes. Pour in white wine, water or a favorite broth. Mix beef and veggies well, scrapping the pot bottom to free up the tasty beef brown bits. Add a bay leaf, optional. 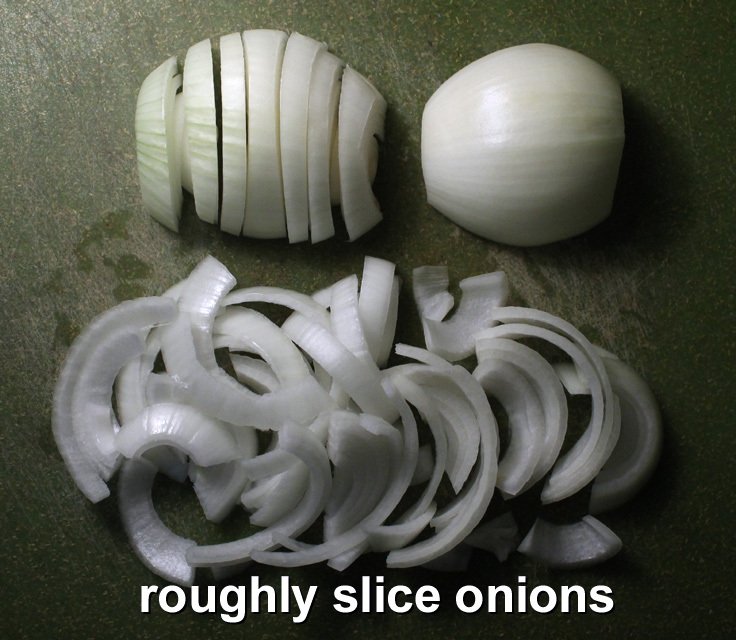 Slice off onion ends, divide the onion, and peel off the papery skin.Rough slice the onion halves. 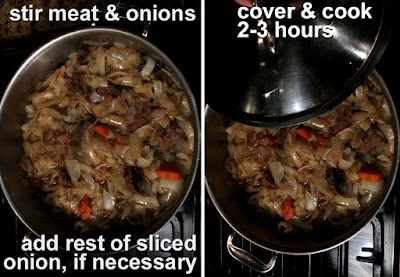 Don't worry about how thin; the onions will shrink and cook down after 2 hours. Now time to bring it all together. Fill up the pot with sliced onions and cover the pot. Keep the heat at a medium/low heat as onions cook down. *If your pot cannot hold all the chopped onion, let the onions sweat and cook down for about half an hour. This will give you room to add the rest of the chopped onions. Now you can mix all the pot ingredients. 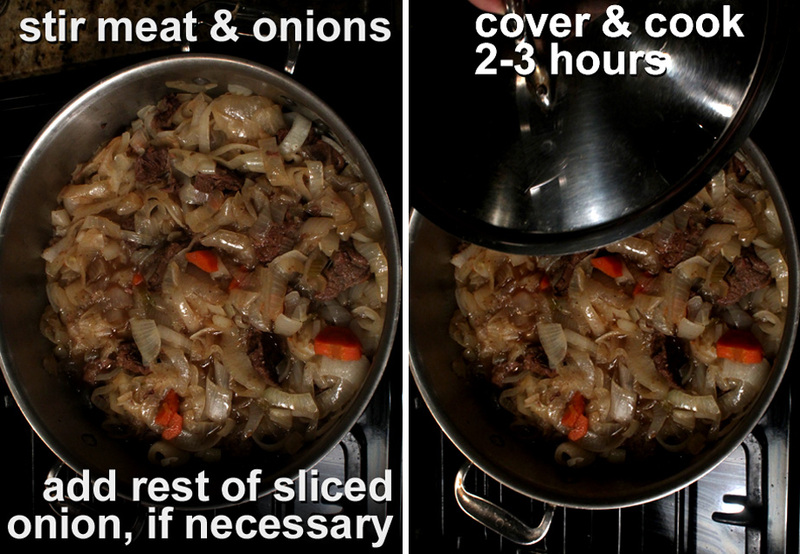 Cover the pot and just keep simmering the meat and onion on low, for about 2-3 hours, until all the onion is reduced. 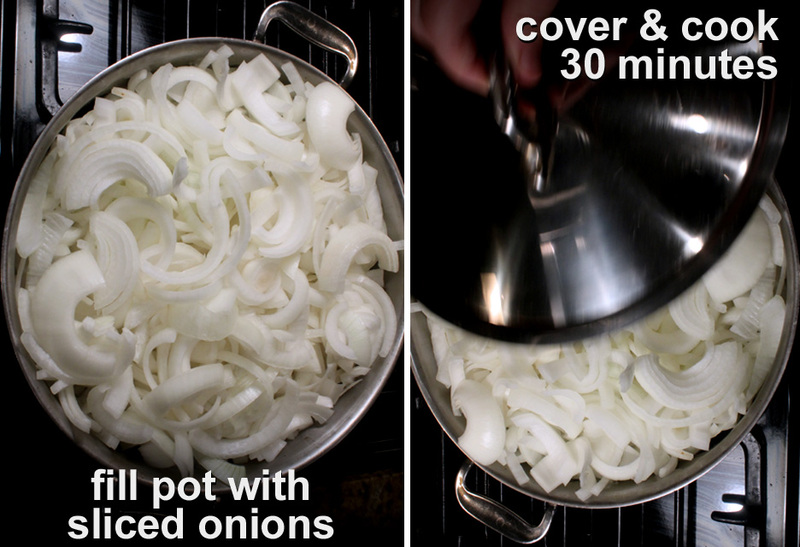 Time will vary, depending how much onion you use. Stir ingredients every half hour or so. You will notice how much liquid the onions give off, about 2 cups worth. Finally, uncover and continue cooking until the sauce is reduced by half, about another 30 minutes (if needed.) Stir occasionally. You want to end up with a sauce that's mainly caramelized onion and meat. It's up to you how thick or thin you like the pasta sauce. Add more broth or water if the liquid cooks down too much. When the sauce is done you can make your favorite pasta. Just keep the sauce warm until the pasta is ready. Serve with dried or fresh parmesan. Heck, this Pasta alla Genovese is good enough without parmesan cheese. Some recipes call for adding 1/2 cup of milk and a tablespoon of tomato paste. I like these additions, too. You want to cook the onions until they are caramelized and starting to break down, at least 3 to 4 hours. It's like cooking dried beans, you can keep the sauce covered and low simmering most of the day if you like (and have the patience.) 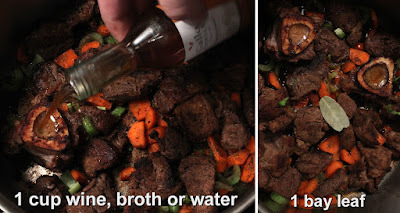 Just check to make sure sauce doesn't dry out - add a little water or broth as needed. You can add more or less meat. It's up to you and your budget. Freeze the leftovers - it microwaves fine. 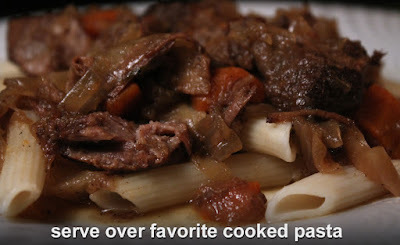 Yea, this looks like it would do really good in the crockpot too...as always love the vids!